Do you still worry that when you go out, nobody will take care of your plants, or sometimes you forget to water them. Being a planter lover, you must be very sad if your plants died without water. These self water spikes are your solution. 1. Take any long neck glass bottle, such as a wine bottle, and fill it with water. 2. Place the self water spike on top of the bottle. 3. 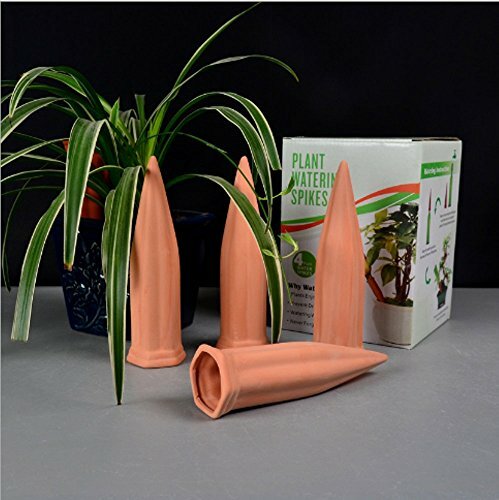 Flip over and stick the plant watering spike into the soil of your indoor or outdoor planter. ENJOY YOUR VACATION :You don't need to worry when you go to travel or on business, trusting your plants will be cared for well by Natural gardening irrigation system. Our automatic plant waterer will regulate humidity of the soil, offering your plants the exact amount of water they need to thrive! EASY-TO-USE: The only thing you need to do is just fill a bottle and insert the Terracotta Plant Waterer into the soil. Transforming manual watering planter into automatic watering planter. E-CO FRIENDLY AND SCIENTIFIC: The made of terracotta, stiff insert into soil, yet friendly to the plant. Recycling used wine bottles that can be used to water your plants. Watering spped is automatically according to the humidity of the soil, never watering too much or too low. WIDE APPLICATIONS: Versatilely use both indoor and outdoor, works with any size of plants. These automatic plant water sticks will add green to home, deck or porch decoration! AN EXCELLENT GIFT-Offer this fast-acting plant irrigation system in the stylish packaging box to your friends, family, co-workers and all gardening enthusiasts. Amazingly efficient for experienced or beginner gardeners. If you have any questions about this product by MyBreeze, contact us by completing and submitting the form below. If you are looking for a specif part number, please include it with your message.